Lately I have been reading a couple of parenting books recommended by fellow bloggers and it has made me really evaluate what kind of mom do I want to be. It has also made me really think about my goals and dreams for Hazel. 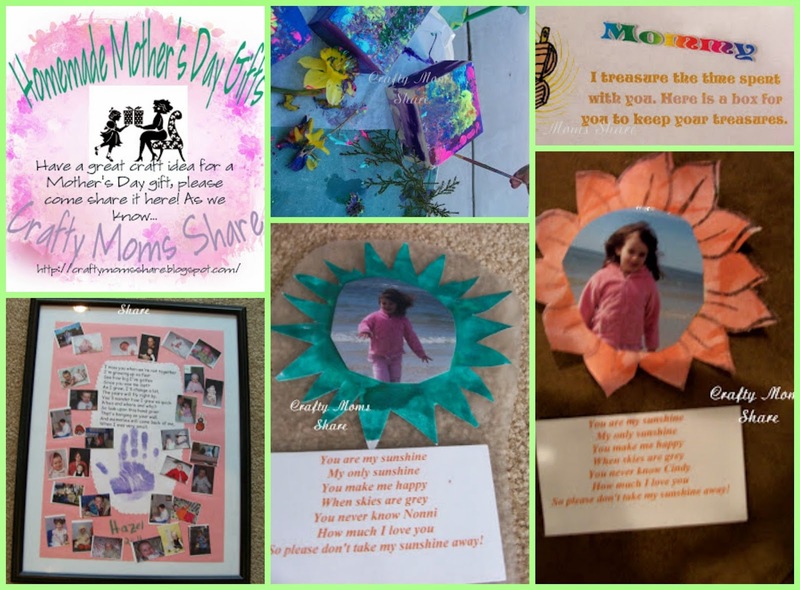 So for Mother's Day I thought I would share this with you as well as some of the things Hazel has made for me this year. First the books. 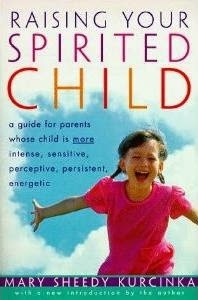 The first book was recommended by Giselle from Kids Yoga Stories and it is Raising Your Spirited Child: A Guide for Parents Whose Child Is More Intense, Sensitive, Perceptive, Persistent, and Energetic by Mary Sheedy Kurcinka. Giselle and I were discussing our children and this book came up as a recommendation. It is a wonderful book from what I have read of it that really helped me understand Hazel a bit more and what she needs. The second book recommendation came from a blog post by Natalie over at Planet Smarty Pants. 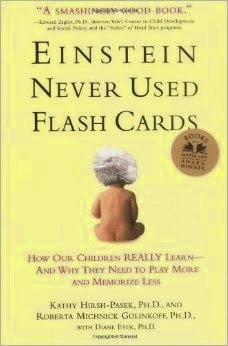 The book is Einstein Never Used Flashcards by Roberta Michnick Golinkoff and Kathy Hirsh-Pasek. This book goes through the research about young children learning and shows the important thing is to interact with your child and to play. My only gripe with the book so far is that they really should know a stop sign is an octagon and not a hexagon, but besides that it is wonderful. I took both books out of my local library and have been reading them when I get a chance. About a year ago we decided to switch Hazel's school because of some things that were happening in her Waldorf classroom and how it was dealt with at that school. So also in the forefront of my mind is evaluating our decision. Now my mother was very for the Waldorf School and does not like the traditional schools that are pushing letters as much. Since the majority of schools around here push letters and learning to read, we did not have much choice beside the Waldorf for not pushing it. However, I do think Hazel was ready for it. She has actually begun to read a bit and she knew her letters long before she started at the new school. Hazel also tells us all the time she is glad she switched schools and that she loves her new school. It has been a few weeks since I heard her tell me she didn't want to go to school which use to be a daily occurrence. She is finally adjusting to all the changes and things that happened last year. Now with all that said, I realized that although I do help Hazel to sound out words, I do not push her to do it. She asks me to let her and help her sometimes. I also have never drilled her on anything. She is starting to ask addition facts and we turn them around to her sometimes. But all of this is driven by her with no expectations from us. I want Hazel to be happy and enjoy childhood. Having taught in some of the top rated high schools in my state, I have seen the pressure kids are under to perform. I do not want Hazel to have this pressure. I know she will put it on herself at some point (after all she does take after me and Steve), however I am going to protect her from it as long as I can. I do not see a reason to be supplementing her education right now with anything besides play. When she asks me a question about something I do not know, we go to the library and get books out on the topic. She learns so much from this books and absorbs them, however, again it is not something that I push. She decides what she wants to learn about and we read them. Recently I was talking to someone who conducts interviews for an ivy league college and she was telling me that the candidates often have achieved huge successes before applying--things like starting their own successful businesses, inventing things, etc. Upon hearing this and considering it, I realized I do not want Hazel to go to an ivy league school. If this is her competition and what it takes to get in, then I fear for the kids who are trying. I know one of the most organized (and overscheduled) high school seniors I know did not get in to the ones she applied and it certainly was not because of lack of brains. The other thing I realized is that Hazel needs alone time. Based on Mary Sheedy Kurcinka' book, she is an introvert and gets her energy from time by herself. She gets grumpy when she does not have time at home to just play. This made me realize it is important not to schedule her for too much more than school. It makes me happy to see her happy. It also made me realize that my goals for Hazel are that she grows up happy and confident. I hope we can give her what she needs to be both. She is already such a compassionate and kind person and I am already so proud of her. I want to be the mom that steps back and lets Hazel just be herself. I want her to be happy in her own skin and to know that we are proud of her for who she is and all she has to do is try her best and she will succeed. I do not want to be a helicopter mom and I do not want to push her into adulthood or even push her ahead in her education. For now I want her to be herself and find the magic that is there as a child. Now for Mother's Day her school has a Mother's Day Tea Party in the Pre-K class (3-day). I went yesterday and the kids sang for us and then had to serve us. They had adorable purse cards for us and tissue paper corsages. 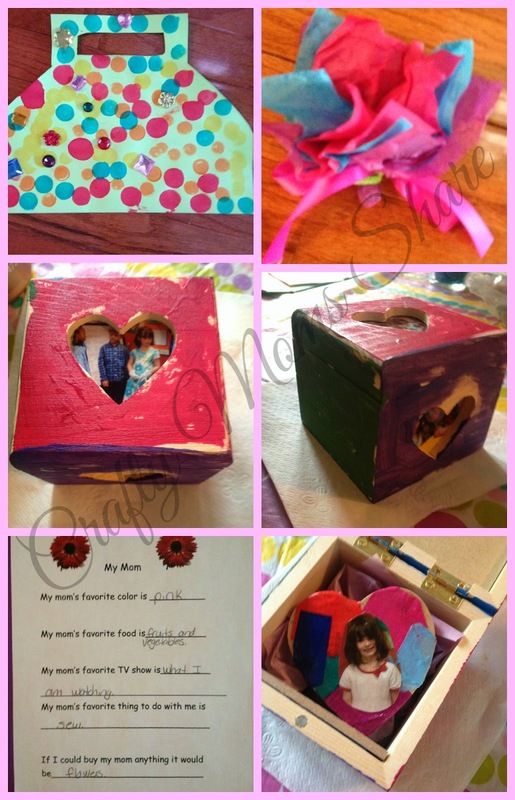 Then the teachers read their My Mom papers and at the end there were gifts to open--a wooden jewelry box with a picture pin inside. I love it! It was the best Mother's Day to date. Since she goes to school five days, there were also gifts from the 2-day class. It included a card, a About My Mom sheet and a scented heart for the car. I love that I am 19 and weigh 15 pounds! 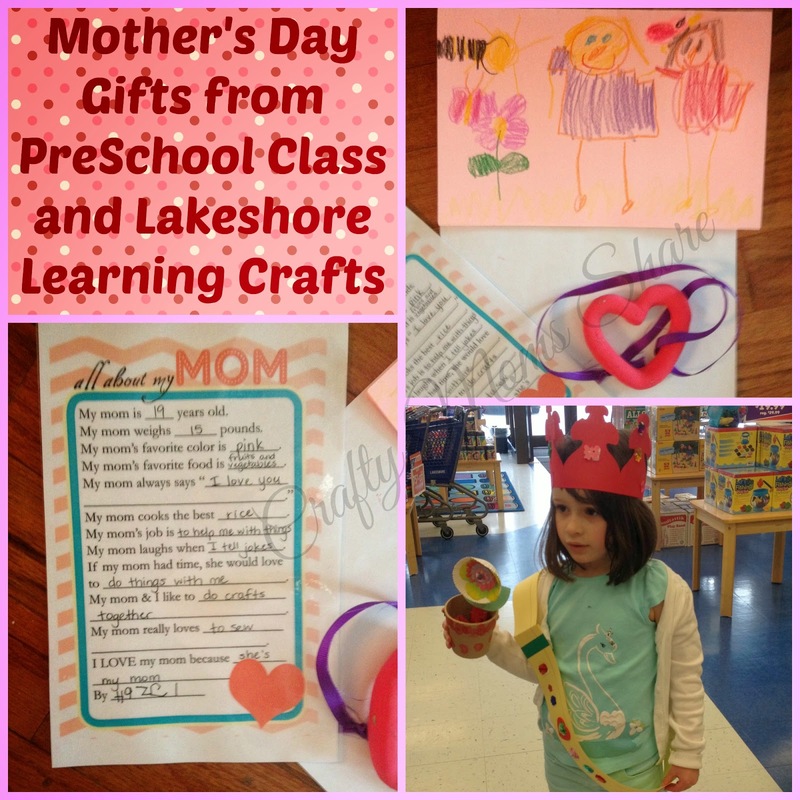 Today we went to Lakeshore Learning for the Mother's Day crafts. I was only allowed to see three of the five she made. I got to see the crown and sash and the little flower. The rest she had the employees help her with so she could surprise me and one of them gave her a bag to keep them in. The picture above shows the crown, sash and flower that she made. They also made a frame and a coupon book. She had a great time! To me this is what Mother's Day is about. It is not about getting expensive gifts. It is about having your child thank you and show you appreciation and love for all you have done. I know that is always what I try to do with my mom as well. Our plans for the day include church and then going to the zoo as a family.